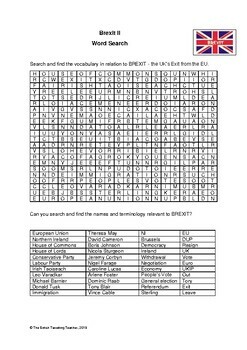 This is a word search which features key vocabulary and terminology around the theme of 'Brexit'. Its aim is to raise students' interest and awareness of the language of 'Brexit'. Names of key decision-makers, political organisations and processes are included. 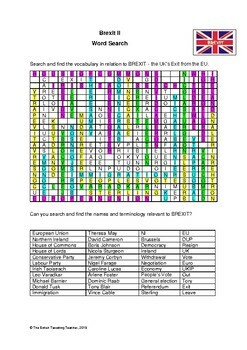 It is suitable for middle school, high school and home school students as a 'fun' activity to supplement their general knowledge of the BREXIT process. This is the second in a series of BREXIT wordsearches. Published in November 2018.